YES! Alert me when the status of this product changes. Figure 1. Treatment of NIH/3T3 cells with PDGF (A), TNFα/IL-1β (B) or IL-6 (C) induces differential phosphorylation of Akt1 at Ser473, Stat3 at Tyr705, p38α MAPK at Thr180/Tyr182, MEK1 at Ser217/221 and NF-κB p65 at Ser536 as detected by the PathScan® Signaling Nodes Multi-Target Sandwich ELISA Kit #7272. While dynamic changes in phosphorylation are observed throughout the time course, the level of total Akt, MEK1, Stat3, p38α MAPK and NF-κB p65 remains unchanged as demonstrated by sandwich ELISA and Western analysis. NIH/3T3 cells (80-90% confluent) were starved overnight and stimulated with either PDGF (100 ng/mL) or IL-6 (100 ng/mL) for 5, 10, 20, 40 and 80 minutes at 37ºC. For simultaneous treatment with TNF-α and IL-1β, exponentially growing cultures of NIH/3T3 (80-90% confluent) were treated for the indicated times at 37ºC with 20 ng/mL TNF-α and 10 ng/mL IL-1β. Lysates were assayed at a protein concentration of 0.45 mg/mL. The absorbance readings at 450 nm are shown as a 3-dimensional representation in the left figure, while the corresponding Western blots are shown in the right figure. The antibodies used for the Western analyses include Akt Antibody #9272, Phospho-Akt (Ser473) (193H12) Rabbit mAb #4058, MEK1 (61B12) Mouse mAb #2352, Phospho-MEK1/2 (Ser217/221) Antibody #9121, Stat3 Antibody #9132, Phospho-Stat3 (Tyr705) (3E2) Mouse mAb #9138, p38 MAP Kinase Antibody #9218, Phospho-p38 MAPK (Thr180/Tyr182) (28B10) Mouse mAb #9216, NF-κB p65 Antibody #3034 and Phospho-NF-κB p65 (Ser536) (93H1) Rabbit mAb #3033. Figure 2. 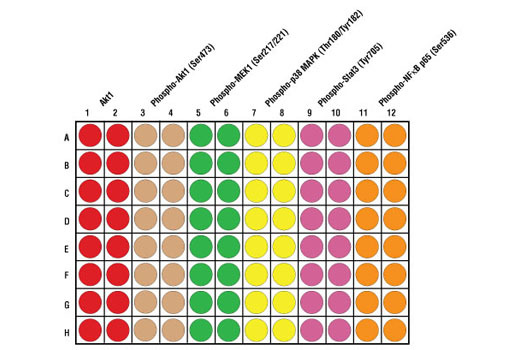 Schematic representation of a 96-well plate depicting the color-code of the reagents used to detect endogenous levels of Akt1 (red; 1 & 2), Phospho-Akt1 (Ser473) (tan; 3 & 4), Phospho-MEK1 (Ser217/221) (green; 5 & 6), Phospho-p38 MAPK (Thr180/Tyr182) (yellow; 7 & 8), Phospho-Stat3 (Tyr705) (dark pink; 9 & 10) and Phospho-NF-κB p65 (Ser536) (orange; 11 & 12). NOTE: Refer to product-specific datasheets or product webpage for assay incubation temperature. 20X Phosphate Buffered Saline (PBS): (#9808) To prepare 1 L PBS: add 50 ml 10X PBS to 950 ml dH2O, mix. NOTE: Refer to product-specific datasheet or webpage for lysis buffer recommendation. Cell lysates can be undiluted or diluted with sample diluent (supplied in each PathScan® Sandwich ELISA Kit, blue color). Individual datasheets or product webpage for each kit provide information regarding an appropriate dilution factor for lysates and kit assay results. Add 100 µl of each undiluted or diluted cell lysate to the appropriate well. Seal with tape and press firmly onto top of microwells. Incubate the plate for 2 hr at 37°C. Alternatively, the plate can be incubated overnight at 4°C. Wash 4 times with 1X wash buffer, 200 µl each time per well. For each wash, strike plates on fresh paper towels hard enough to remove the residual solution in each well, but do not allow wells to completely dry at any time. Add 100 µl of detection antibody (green color) to each well. Seal with tape and incubate the plate at 37°C for 1 hr. Add 100 µl of HRP-linked secondary antibody (red color) to each well. Seal with tape and incubate the plate for 30 min at 37°C. Add 100 µl of TMB substrate to each well. Seal with tape and incubate the plate for 10 min at 37°C or 30 min at 25°C. Add 100 µl of STOP solution to each well. Shake gently for a few seconds. NOTE: Initial color of positive reaction is blue, which changes to yellow upon addition of STOP solution. CST's PathScan® Signaling Nodes Multi-Target Sandwich ELISA Kit is a solid phase sandwich enzyme-linked immunosorbent assay (ELISA) that combines the reagents necessary to detect endogenous levels of Akt1, phospho-Akt1 (Ser473), phospho-MEK1 (Ser217/221), phospho-p38 MAPK (Thr180/Tyr182), phospho-Stat3 (Tyr705) and phospho-NF-κB p65 (Ser536). These molecules represent convergence points and key regulatory proteins in signaling pathways controlling cellular events such as growth and differentiation, energy homeostasis, and the response to stress and inflammation. Sixteen tests are provided for each target protein. Specific assay formulations for the indicated target proteins can be found in the datasheets associated with the individual PathScan® Sandwich ELISA Kits*. Briefly, a capture antibody has been coated onto the microwells. After incubation with cell lysates, the target protein is captured by the coated antibody. Following extensive washing, a detection antibody is added to detect the captured target protein. An HRP-linked secondary antibody is then used to recognize the bound detection antibody. HRP substrate, TMB, is added to develop color. The magnitude of absorbance for this developed color is proportional to the quantity of bound target protein. CST's PathScan® Signaling Nodes Multi-Target Sandwich ELISA Kit #7272 detects endogenous levels of six proteins: Akt1, phospho-Akt1 (Ser473), phospho-MEK1 (Ser217/221), phospho-p38 MAPK (Thr180/Tyr182), phospho-Stat3 (Tyr705) and phospho-NF-κB p65 (Ser536). Differential phosphorylation of these proteins can be observed over time in response to various growth factor and cytokine treatments, as shown in Figure 1. The relationship between the protein concentration of the lysate and the absorbance at 450 nm can be found in the datasheets associated with the individual PathScan® Sandwich ELISA Kits*. *See companion products. This kit detects proteins from the indicated species, as determined through in-house testing, but may also detect homologous proteins from other species. Akt is a protooncogene with a critical regulatory role in diverse cellular processes including growth, survival and the cell cycle. Akt is also a major regulator of insulin signaling and glucose metabolism (1-4). Akt is activated by PI3 kinase signaling and activation loop phosphorylation at Thr308 by PDK1 and by phosphorylation withing the carboxyl terminus at Ser473 by PDK2 (5-7). MEK1 and MEK2 are dual-specificity protein kinases that function in a mitogen activated protein kinase cascade controlling cell growth and differentiation. Activation of MEK1 and MEK2 occurs through phosphorylation of serine 217 and serine 221 by Raf-like molecules. MEK activates p44 and p42 MAP kinase (8-10). p38 MAP kinase (MAPK) participates in a signaling cascade controlling the cellular response to pro-inflammatory cytokines and a variety of cellular stresses. MKK3, MKK6 and SEK (MKK4) activate p38 MAP kinase by phosphorylation at Thr180 and Tyr182 (11-14). The Stat3 transcription factor is an important signaling molecule for many cytokines and growth factor receptors. Stat3 is activated by phosphorylation at Tyr705, which induces dimerization, nuclear translocation and DNA binding (15,16). Transcription factors of the nuclear factor κB (NF-κB)/Rel family play a pivotal role in inflammation, stress and immune responses. There are five family members in mammals: RelA/p65, c-Rel, RelB, NF-κB1 (p105/p50) and NF-κB2 (p100/p52). These proteins function as dimeric transcription factors. In unstimulated cells, NF-κB/Rel proteins are sequestered in the cytoplasm and inhibited by the IκB proteins. NF-κB-activating agents induce phosphorylation of IκB's, targeting them for degradation and thereby releasing the NF-κB/Rel complexes. 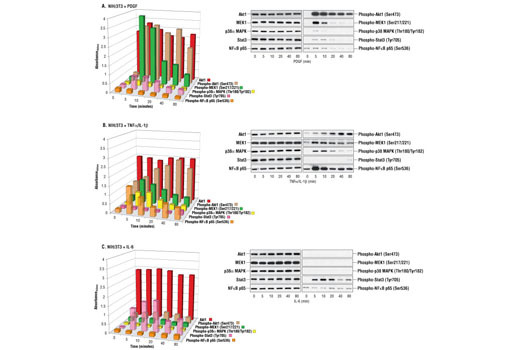 Active NF-κB/Rel complexes are further activated by phosphorylation (17-20). Kim, D. and Chung, J. (2002) J Biochem Mol Biol 35, 106-15. Manning, B.D. and Cantley, L.C. (2007) Cell 129, 1261-74. McKay, M.M. and Morrison, D.K. (2007) Oncogene 26, 3113-21. Zdychová, J. and Komers, R. (2005) Physiol Res 54, 1-16. Ghosh, S. and Karin, M. (2002) Cell 109, S81-S96. DiDonato, J. et al. (1996) Mol Cell Biol 16, 1295-304. Song, G. et al. J Cell Mol Med 9, 59-71. Sakurai, H. et al. (1999) J Biol Chem 274, 30353-6. Raingeaud, J. et al. (1995) J. Biol. Chem. 270, 7420-7426. Alessi, D.R. et al. (1994) EMBO J 13, 1610-9. Pearson, G. et al. (2001) Endocr Rev 22, 153-83. Raman, M. et al. (2007) Oncogene 26, 3100-12. Zarubin, T. and Han, J. (2005) Cell Res 15, 11-8. O'Shea, J.J. et al. (2002) Cell 109 Suppl, S121-31. Kaptein, A. et al. (1996) J Biol Chem 271, 5961-4. Mattioli, I. et al. (2004) J Immunol 172, 6336-44. Oliveras-Ferraros, C. et al. (2010) Int J Oncol 37, 669-78.